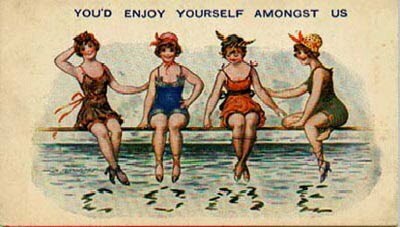 In my book, Bawdy Bisques and Naughty Novelties, the chapter entitled "Jeepers, Creepers, Where'd You Get Them Peepers", focuses on the comic goo-goo eyed bathing beauty figurines so popular in the 1910s and 1920s. 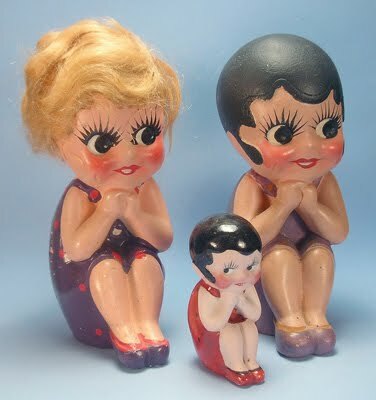 In 1919, Playthings, a magazine for the toy trade, announced that the novelty vogue of the year was wide-eyed "beach dolls" made of wood fiber or composition. The chapter features these three coy cuties, all incised "Splash Me." The two larger star-eyed sylphs are of composition or plaster and are 6 inches tall. Their little bisque sis is 3 inches high. The large dark-haired damsel retains her original paper label stating the figurine was copyrighted in 1918 by Gene George, with a design patent date of December 11, 1917. My original attempts to hunt down the design patent by either "Gene George" or "Splash Me" were unsuccessful. Then I came across this same coquettish cutie in the form of soap, with her original box. Here the box declares that the 1918 copyright is by Genevieve Pfeffer, and gives the design patent number. The name "Gene George" also appears in cursive script. This sudsy sweetie is 3.5 inches high. Armed with the patent number, I easily located the design patent, which is in Genevieve Pfeffer's name. The 1917 patent is for an "ornamental design for a doll," and gives Ms. Pfeffer's address as San Jose, California. Note that the design varies slightly from the actual dolls. In the design, the doll rests her head on a fist tucked beneath each cheek, while in the figure, the hands are folded together under her chin. The patent design also shows bare feet, but the dolls have molded bathing slippers. 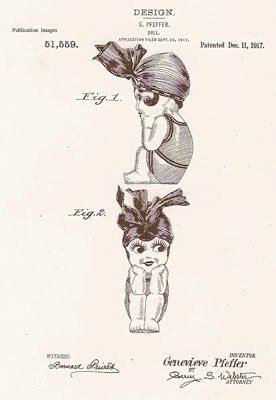 According to a 1920 patent infringement suit brought by Pfeffer against Western Doll Manufacturing Company, Pfeffer based her Splashme on the pensive Kewpie (sometimes called "The Thinker") designed by Rose O'Neill. 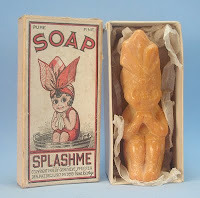 Although the Splashme in the patent lacks the Kewpie's molded wings and tuffs of hair, the position of her hands and her bare feet match those of the Kewpie. However, Pfeffer did not slavishly copy the Kewpie. 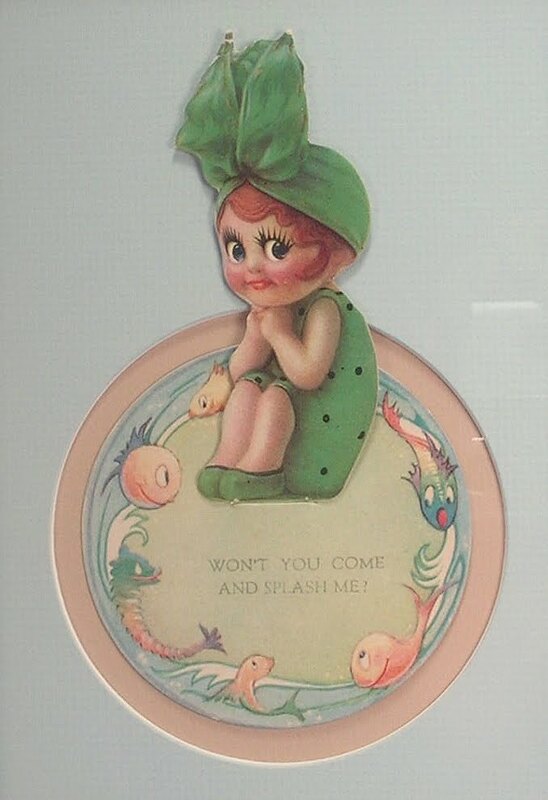 The Splashme's saucer-shaped eyes with their star-burst of long lashes, full red lips parted to expose white teeth, and flapper's bobbed hair make Pfeffer's creation unique and no causal consumer could mistake the rather seductive Splashme for O'Neill's more innocent imp. The name of Genevieve Pfeffer may now be added to the roll of female artists of this period, such as G.G. Drayton, Rose O'Neill, and Grace Putnam, who all designed dolls. But who was Genevieve Pfeffer and who was Gene George? This cute card provides another clue. The copyright date on the back of the card is 1920 by "Gene George Pfeffer," and refers back to the original December 11, 1917 design patent date. Gene could certainly be short for Genevieve. Through a search of various genealogy websites, I located an article by Ray Radley in the Winter 1999 edition of the Russian River Recorder entitled "The Splashme doll." The Russian River Recorder is a quarterly publication of the Healdsburg Museum and Historical Society and features stories and photographs relating the history of Healdsburg and northern Sonoma County, California. Thanks to the generous help of the historical society, I was able to obtain a copy of the article (Radley, Ray. The Splashme Doll. Russian River Recorder, Winter 1999). According to this article, Genevieve Pfeffer was born to a well-to-do family in San Jose California, on December 9, 1890. She attended both Stanford University and the Mark Hopkins Institute of Art. In 1917, together with her sister Georgene, who was also an art student, Pfeffer designed the Splashme doll. The business name Gene George was a combination of the sisters' first names. Pfeffer contracted with George Borgfeldt and Company of New York to be the doll's sole distributor. By 1918, the dolls were being offered with both silk kerchiefs or with mohair wigs. A 1921 advertisement from the wholesale catalogue Butler Brothers advertised the "Splash Me" dolls as "Gene George's clever conceit" and as being made from flesh tinted bisque finished composition. The dolls were offered either with a kerchief caps over painted hair or with a mohair wig in a "fashionable veil covered coiffure." Radley's article states that the dolls were an instant hit when Pfeffer first introduced them in Santa Cruz, California, in 1918, Pfeffer receiving over $250,000 in orders. Florenz Ziegfeld made the Splashme doll a theme in his Midnight Follies and Atlantic City held Splashme bathing beauty contests. The article quotes movie star Mary Pickford as stating, "Splashmes are a delight to have around and one cannot help but smile when looking at them." According to a 1920 patent infringement case brought by Borgfeldt, some 360,000 Splashmes were sold between April of 1918, when they were first marketed, and June of 1919, with the amount of sales said to be between $500,000 to $1,000,000. The Splashmes appeared not only in doll form, but also as party favors, postcards, and children's books. Genevieve Pfeffer did not continue with her career as a doll designer despite her creation's success. She married bank president George Warfield and moved to Healdsburg, California, where she was a civic leader and a grand lady of Healdsburg society. However, her design continued to be widely copied and crude plaster knockoffs were given away as prizes at carnivals and on boardwalks for many years.